Can someone explain to me exactly why speed boots do away with ankle support? Getting used to not having the extra ankle support is a big, big step in making the transition to speed skates. Less weight? sure, a bit. Ankle flex? I've heard this mooted, but can you really do stuff in a low cut boot that you can't in a cuffed boot? Or is it just to stop the plebs from invading the speed scene? Otherwise less weight is main reason for me, and more power on push because of ankle push. As is said above, a key part of what most speedskaters do is varying the angle of the foot, front to back, and side to side. This is all done by bending the ankle various ways, because the ankle is the only body part that's flexible enough to do that. Other body parts bend also, but without ankle flex, the body movement is incomplete. It's key to double push, but important to good speedskating other than double push. Depending on your definition, speed skating can be done in high boots. Some skaters in high boots skate fast, faster than some skaters in low boots, but not as fast as they could if they got low boots and trained to use them well. You'll occasionally see slalom skaters wearing free skates and jeans, outpace lycra clad speed skaters, not really relevant but funny as hell. The point is ankle flex allows access a higher top speed, it doesn't make you go faster. Agree that ankle flex allows faster skating if properly used, as do speed skates, large wheels, and lycra. None of these give speed in themselves, but actually can slow a skater who doesn't use them properly. I expect the faster speed by slalom skaters would only be for short distances, and when the person is more running than skating. Proper speed skating is more efficient, uses less energy per minute. Ankle flex is also important in cross-overs, which are important to do on the circular tracks which allow organized speedskating to be done. Part of the whole speed skating thing is keeping low, including your hips close to the ground, so your leg can push far out to the side, which can greatly increase the amount of power you can apply with each push. When you're low, during the skating stroke, your foot, ankle, and leg go through various positions, from under your body, to far out to the side, which can only be done well if you bend your ankle. Getting used to not having the extra ankle support is a big, big step in making the transition to speed skates. Ya, you can. Just like how the aggro guys and I think slalom, too, leave their cuffs loose to be able to hit certain edges or land on a rail a certain way. Ya, this might be it. There is a limited supply of spandex, and if more plebs invade, spandex prices will go thru the roof... I used to wonder the same thing though, if it was just an affectation. 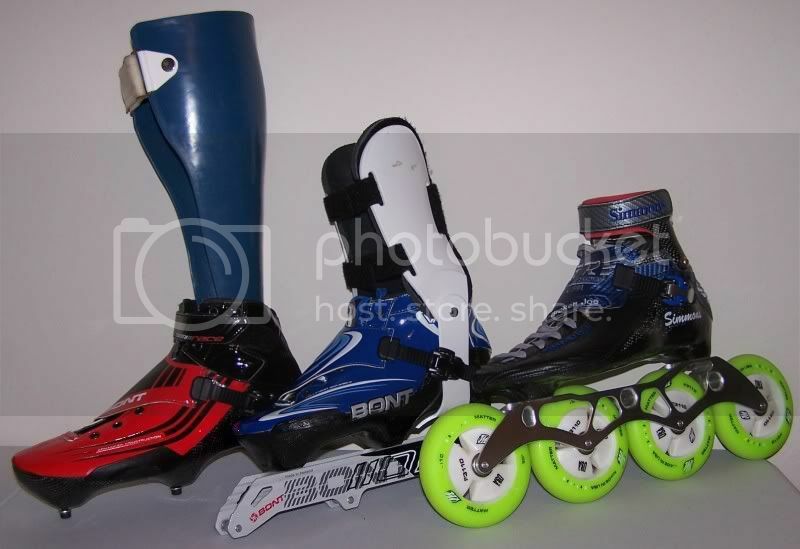 But then, the very first time I wore speed boots (same wheels and bearings as my speedness boots) I was faster. All that said, look at the finish line photos of major races. The fastest groups will all be in speed boots, but pretty soon guys and girls in old hockey skates start showing up, right next to serious speedskaters in custom boots. The equipment helps, but it's not magic. Thanks, Jim. That's as good an explaination as I've heard! Bill.. for me.. I am finding the lack of ankle support makes a massive, massive difference. Now, I know that they are still new and I need to put in more hours and more miles, but it is just my conclusions based on my own experiences. when most skaters get to a certain level, they feel hampered and restrained by a higher cut boot. This is not true in 100% of the cases, but most. I personally need that freedom of movement in the ankle area while still maintaining the snugness of the skate on my foot. That just can't be achieved in a higher cut boot. I was probably a bad enough skater when I made the switch that it was no big loss... Lately I am having some trouble with my lower legs not being strong enough to do what I am asking them to do, so maybe I answered too quickly. I am not much of a speedskater, in fact can't really even call myself that, I just do to motivate myself. I have tried all manner of boots and I find the midcut like the Bont Jet or Powerslide C4 is perfect. Enough ankle support so you don't have to be an exceptional skater but low enough to where you can experiment and fine tune your form. As the excellent skaters have replied there is a lot to be said for "ankle flex". For me, I really don't understand it but what I do feel in skating and is one of the things that makes it so frustrating and yet so wonderful is that just a milimeter of change in one thing or another or a little different force applied at just a slightly different moment and you suddenly find yourself going noticeably faster. Sometimes this will happen to me and I like wonder if it is me. Sometimes I'll be brave about it and keep pouring it on and other times I kind of back off because I'm going uncomfortably fast. Sort of like playing a musical instrument. The chord may be easy to play but for some reason it seems next to impossibly to play it perfect. Then one day you do and freak and then can't again. This goes on and you hit more good notes than bad but years and years later, you would think you would play everything perfect but nooooo, still not perfect. And it is just a matter of moving your fingers perhaps a half a milimeter on the fretboard but makes such a difference in tone. Ok, sorry I blah blah'd. Being a novice I can say that if you get a good midcut speed boot it will allow you to start skating speed style and in that process you will see that what the pros do and teach really does work and you go fast. When you get your form down and strength then maybe go lower cut, I am sure if you can use that tool properly you will go faster, otherwise all those pros would use something else. I have tried a low cut boot and tried and tried again and I am just not good enough to use that tool properly. I do ok in the mid cut but not low cut. I am sure it is my bad technique or something I'm doing wrong but that goes back to being good enough to properly use the tool. As much as I would like to think I could drive an Indy car I bet I would kill myself trying to drive such a thing. It's a range of motion thing. Yes, you can do more with a low cut boot. A low cut boot can be more responsive and potentially more supportive once the ankle strength is sufficient. Ok, now you guys are confusing the l'il kiwi. What's all this talk about ankle flex being a good thing? How does this relate to Joey M's 'keep a firm ankle' mantra? You've all seen the Pascal Briand double push clip on youtube, right? I could just watch that slow motion segment over and over. But I see very little, if any, ankle flex during a full double push cycle. There is a bit of ankle rotation (during the inside to outside carve), but that motion wouldn't seem to be restricted by higher-cuffed boots. So what am I missing here? Jim, can you explain what you mean when you say, 'ankle flex allows faster skating if properly used'? "Experience is a hard teacher because she gives the test first, the lesson afterwards." ~Anon. When you bend your knees, they go forward, your ankle flexes and your shins are at an angle instead of straight up and down. Like the letter Z. A "high cut" stiff boot limits the forward motion of the knee bend which tends to hold the shin straight. Ahhhhh, Leroy, of course. Duh. I guess I'm so fixated on side to side ankle flex I completely forgot about the forward flex. Double-Duh because I've actually been much more mindful of that lately during my training skates. Disregard my comments, gang, I'm obviously clueless! Although the side to side movement is not as noticiable it is there. My husband has nerve damage in his left foot and leg so we have tried a series of different boots thinking the more support the better for him, NOT SO... The higher the brace/support the worse his crosses were. Dave made something like that like 4 years ago for Charlie Craven of Danger Racing... Charlie has a shin problem and that is what forced him to stop skating at a pro level. These skates helped him get back into the grove and one day soon you could see him again. This is my primary reason that I use low cut boots. I need the forward motion for starts and sprints. Although not as important, I like having backward motion in case I have to make a last second hawk at the line. Tall boots don't allow you to keep the front wheel on the ground which is the wheel the USARS rules care about. It is the first wheel that is on the ground that counts for the finish.